I tend to think that the reports of doping by Russia’s athletes, like this report in the Guardian entitled How Russian athletics’ rotten system built a wall to conceal doping and deceit, could be more significant politically. than anybody thinks. After all it follows a very similar pattern to their dealings with Ukraine and other former Soviet possessions, where Russia thinks itself to be able to ignore the standards of the rest of the World. They should be banned from the Olympics in Rio! I also suspect that the bombing of the airliner in Egypt was not deliberately targeted at a Russian plane. If that is the case, as some experts have said, it was Putin’s bad luck and our good! The sooner Putin is removed from power, the better it will be for everyone. Except perhaps for a few Russian oligarchs! My father, who was a very strong anti-dictator and anti-fascist would rate Putin alongside Hitler and Stalin. He would have laughed like a drain at Peter Brookes cartoon in The Times, where Putin is shown laying a wreath sfter the air crash, with a speech bubble of “What sort of a rat blows hundreds of innocent civilians out of the sky?” As he turns to walk away, you can see his rodent’s tail. Is liking cartoons in my genes? We are all worried about what Islamic State will do to important world heritage, as is reported on the BBC in this article about Palmyra. In Leipzig I came across a modern church that was not to my liking with a model of an old Gothic church in front. So I got thinking, that perhaps the church was something like a cathedral or important church that had been destroyed in the Second World War. The model church is the Paulinerkirche and it stood on the site. Wikipedia sums up what happened to the church as follows. The church survived the war practically unscathed but was dynamited in 1968 during the communist regime of East Germany. After the reunification of Germany, it was decided to build a new university church on the site in the shape of the former church. A new building, the Paulinum (formally: “Aula und Universitätskirche St. Pauli”, i.e. “Assembly Hall and University Church St. Paul”), was built on the site beginning in 2007. The Nikolaikirche in Leipzig is introduced in Wikipedia like this. As I was close I had to visit. It seemed shut, so unfortunately, I had to pass on a visit to such an iconic place in the fall of another evil dictatorship. In Peaceful Demonstrations in the church’s Wikipedia entry this is said. But then my father always said that St. Paul’s stood defiantly against the Nazis in the Blitz. 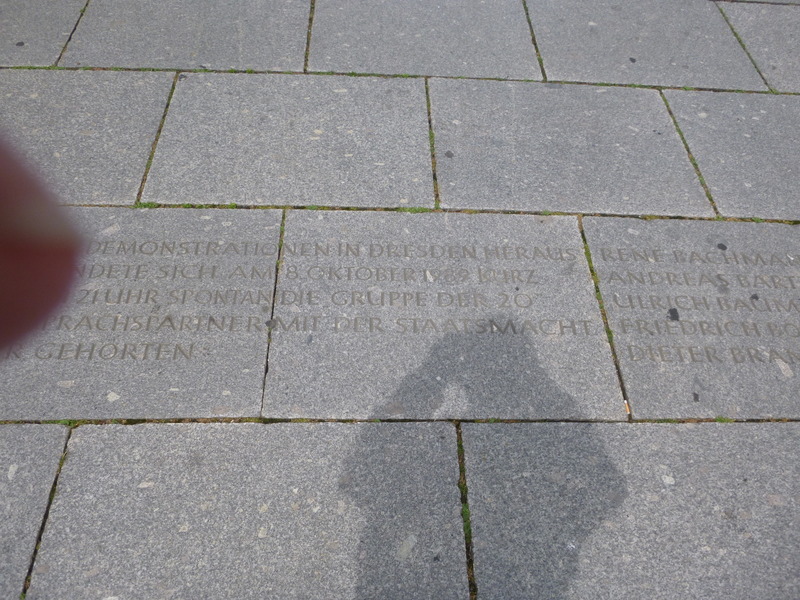 I came across this inscription in the pavement dated to the 8th October 1989 by the Dresden Hauptbahnhof. I can’t find anything about it directly on the web, but it is probably connected to this section in Wikipedia’s entry for the Monday Demonstrations In East Germany, which says this. A major turning point was the events in the West German Embassy of Prague, where thousands of East Germans had fled in September, living there in conditions reminiscent of the Third World. Hans-Dietrich Genscher had negotiated an agreement that allowed them to travel to the West, in trains that had to pass first through the GDR. Genscher’s speech from the balcony was interrupted by a very emotional reaction to his announcement. When the trains passed Dresden’s central station in early October, police forces had to stop people from trying to jump on the trains. The White Crosses are a memorial to those who died at the Berlin Wall. Time dictated that I didn’t have enough tiome to visit the actual wall. Perhaps next time?